A while ago I mentioned being in the “home stretch” on the book I’m writing. A bunch of people were very encouraging when I said that, which, well, encouraged me. (Thanks, everyone.) Thing is, I still am in that home stretch, pretty close to where I was at the time I made that comment, in fact. I’m kind of stuck there. Not writing-stuck: I would be done the draft if it wasn’t for the exigencies of life. A recurrent, won’t-go-away ear infection has been gnawing on our son, and I developed bronchitis (seemingly the same damned bug), just as a week earlier it gave my wife a sore throat. Now there’s a sudden slurry of other work that’s dropped onto me and which needs to get done soon. That leaves me stuck somewhere in that last stretch. I think life just has a way of doing that, but… I’m still slowly loping my way toward finishing the draft, in defiance of it all. It’s just the defiance is slower than I’d hoped to be able to manage. Still plugging away, though. The end remains in sight, and it’s not drifting further off or anything. Well, maybe it’s drifting a little, but in a completely bad way. For one thing, I’ve had a chance to take a step back and think about some inconsistencies that linger in the narrative: how did X happen, after all, and how in the world did character A manage to do B while also stuck doing C? Wait, how does system Q work again? Of course, every one of these little problems that occurs to me (usually while I’m in the shower) ends up in fifteen foot-tall letters, emblazoned across the front of my mind until I can go take a note in the manuscript. Each one just hammers home the certainty that I’ll still be working on this in September, when I’d hoped to have the draft pretty much done in August. Still, I’m keeping it in perspective: after all, I expected to have to do some editing and tidying and reworking before I sent it out to people. I thought I’d have completed this draft by now, but I knew it wouldn’t be out with readers yet anyway. Taking a step back has been good in other ways, too. Some stuff has happened that I wouldn’t have missed for the world. For example, I have fond memories of my dad making pizza “with me” when I was a little kid. I’m pretty sure this would have been when I was in first or second grade, because as I remember it, we did this on nights when my mother was working at the nursing home, a job she left once I was in the middle of second grade and which she didn’t return to for a few years. The way I remember it, my dad made the crust and prepared the toppings, and he let me arrange the toppings on the crust before he popped the pizza into the oven to cook. I remember mushrooms, and—pretty distinctly—recall cheddar cheese being the one we usually used. (I still like it on pizza, even if I know it’s kinda “wrong.”) I don’t know how often it was that we did this together: memories from that time, when I retain them at all, are stunningly vivid. I clearly, clearly remember the night I was allowed to stay up late and watch Rikki Tikki Tavi on CBC, for example. Oh, the elation! Yeah, maybe it was just a few times we made pizza together, but it feels like it must have happened kind of regularly. I swear, if we were in Canada I’d even have picked up the Kraft pizza kit just to see if it still tastes like I remember (because I do distinctly remember the box on the table when we were making it, this one time). But in my mind, this was a semi-regular occurrence, something we did together. It felt good to make food with my dad, I guess, though the importance I attach to it only really occurred to me in hindsight. 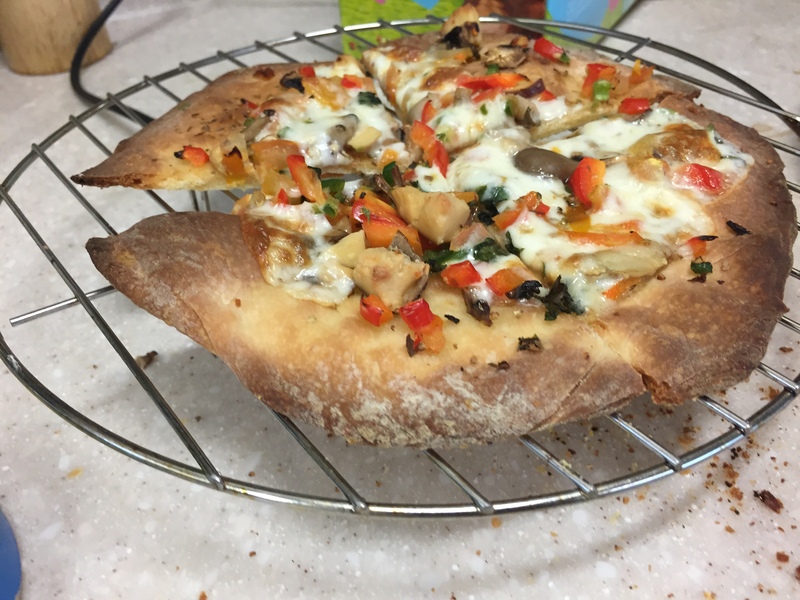 Well, yesterday, my wife and I did the same thing: I got out the dough I’d left overnight in the fridge (something my recipe recommends), and prepared all the toppings, and then my wife showed our son how to spread the toppings out. He eagerly joined in, and pretty soon, it was ready to pop into the oven. He may be finicky about vegetables on his plate—we have to hide them under the rice or folded into bread to get him to eat them, most of the time—but arranging them onto a pizza crust struck him as fine entertainment. It turned out… well, not bad, though our little oven isn’t really hot enough to make pizza as quickly as you need, and it leaves something to be desired. Still, it’s kind of amazing: our little boy can’t really even speak full sentences yet, but he’s already having fun cooking with us, and we’re keeping a kind of mini-tradition alive. I say it’s a “kind of” mini-tradition because later on, my dad and I didn’t make pizza together. He ran a pizza shop late in life—after I’d moved out and just before I left Saskatoon for good—but from about middle school onward, I don’t think we cooked together much, if at all. I feel sad saying that, but, well… things got in the way.We both let them. There’s a lesson to be learned there, too. I guess all of this a reminder that life is fleeting, childhood is fleeting, and it’s important to make time for those kinds of things when you can… and to remind yourself you can, to keep things in perspective. The book will get finished, hulking monster of a thing that it is, but it’s not worth missing the fun of seeing my son take that first bite out of a piece of the first pizza he helped make… and smiling the happiest smile in the world. I don’t usually post pictures of him here, but this one time, I can’t resist.